I just wanna share my experience awhile ago. It happened in a jeepney routing from Santolan to Sta. Lucia East Mall. 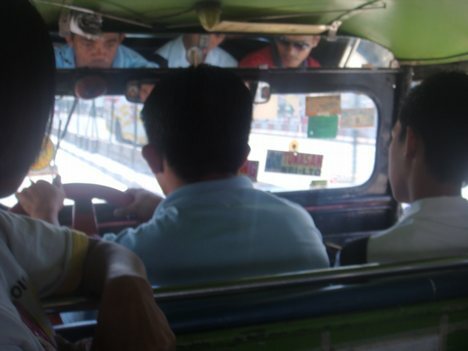 I always look for a jeepney with few people inside because I'm shy if I'm alone. This time I'm going home alone ( which happens once every 1000 years ) and my first instinct is to find the jeepney with the fewest boarder. Outside the Santolan Lrt Station wai...ts a lot of jeepney, and so I am looking for the loneliest one. A couple of steps and Voila I found it, a poor little empty jeepney ( HAHAHA ). I sit beside the driver so that I can play psp (Patapon 3 XD) easily. Minutes pass, the jeep is half full, I also noticed that the driver is always rubbing his tummy ( the same thing we do when we are hungry), but I don't mind that, what happened next makes me care. The jeep is full and ready to go, and this is the time when we will give our fares, every person that gives him their fare he always says "Thank You" twice or trice per person, AS IN PER PERSON, I am beside him so I noticed it and I think I am the only one who noticed it. We got stuck in a traffic jam in Ligaya, that time I'm not giving my fare yet because I'm playing psp. Curiosity strikes and I ask him a question and besides he looks like a good guy. "Boss, bakit ka thank you ng thank you kanina pag may nagbabayad?" He answered "kasi itong mga baryang to ang bubuhay sa anak ko"
I don't understand that easily and so we make some more conversation. Driver: "Oo anak meron, leukemia"
I stay silent after I heard that, I turn off the psp and look somewhere else because in other words e nakaka awa pero mas naawa ako lalo ng makita ko ang tatlong picture na naka clip sa left side mirror right side mirror at yung mirror sa taas ng ulo ko. I know how to drive so that I know that you will always look in that mirrors every second while you are driving, ALWAYS. And now I know why he always rub his tummy. It makes my eye teary but I'm a man so I fight it. I get my fare, 100 pesos na buo and give it to him. "Boss Sta. Lucia lang, isa." as soon as I gave the money he count some coins for my change and that same time I said "Hindi na boss ok lang kunin mo na po yan" sabay ngiti. And there again I hear the thousand thank you from him. Tama si sis Michi. These are the type of people na hindi ka manghihinayang bigyan ng money.